I'm a huge admirer of Muhammad Ali and a massive fan of Mego's vintage 8-inch action figures from the 1970s, so this Ali meets Mego action figure has always been a must-have item for me. I finally managed to track one down at a fair price in an online store recently and have had it in my possession for only a short time, but I became instantly smitten the moment I unrolled him from the bubble-wrap packaging. He really is fantastic! Mego really upped the ante with their Ali figure. 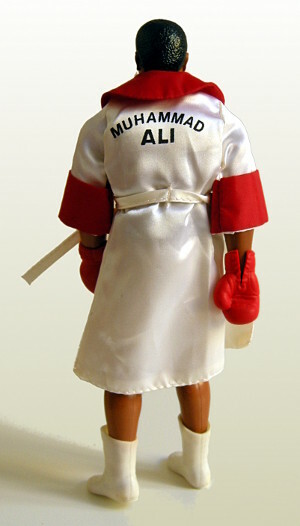 The company produced very few sports personalities, and this 1976 version of the then reigning Heavyweight Word Boxing Champion saw them creating an all new figure mold – a 9-inch tall figure, with rubber skin encasing the limbs so that his joints are hidden, wearing soft rubber boxing gloves with the Everlast logo, white boots, chunky Everlast belt, and even a sparring helmet (which my figure is sadly missing). The attention to detail in the accessories was second to none – check out the silky white robe with red trim, belt and pockets, and of course, his name on the back, and the red stripe on his shorts. The figure also feels heavy in the hand – as befits a proper heavyweight boxer! L - "I'm too pretty"
The basic articulation is pretty good – he moves at the shoulders, elbows, wrists, hips, knees, and ankles – but the major gimmick with this figure was the “Ali Trigger Mechanism”. This was a special boxing action which could be activated by attaching a yellow plastic trigger to a small hole in the figure’s back - pressing the trigger would make Ali throw punches. My loose figure is missing this trigger, although the mechanism would still appear to be working fine – swivel his hips and he willl still land a nifty right hook! 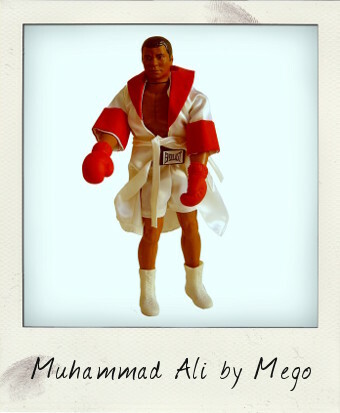 The fighting mechanism was pretty useful for any kids that were lucky enough to be given the full Muhammad Ali Boxing Ring set, where Ali and an opponent called "Manila Mauler" (who had clearly been modelled on Ken Norton) could thrash it out. 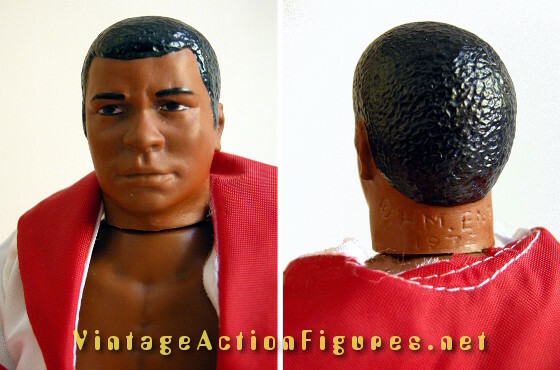 In spite of Ali being at the peak of his global popularity and fame after the Rumble in the Jungle and Thriller in Manilla bouts of the previous years this figure wasn't a massive seller at the time. It has stayed a firm favourite with Mego fans and collectors, however, and is a highly sought-after vintage action figure collectible today. Oh, and a final word of warning...Don't anybody dare call this Mego figure a DOLL!